Stirling Ghostwalk :: Ressurrection Men! During early performances of the Stirling GhostWalk, back in 1990, I was warned by an aged and carnaptious biddie, a resident of St Mary's Wynd at the heart of the Old Town, that my fellow performers and I should avoid the spirit of The Pink Lady - probably the most famous spectre said to haunt the historic Auld Kirkyard adjacent to the Holy Rude church. "Dinnae fash the quine!" was the biddie's stern rebuke. In other words 'Don't bother the poor girl!' In the old dear's understanding the ghost was the spirit of a grief-stricken young mother, searching for the grave of her dead child. Pink in the colour-coordinated lore of Victorian spook-ology is often linked with love or yearning. A sad tale, if true. Others in the town confidently assured me that The Pink Lady was linked to another equally upsetting incident, and to a very specific headstone within the graveyard. If true, then this account makes The Pink Lady unique, in that she is the only one Stirling's famous female phantoms to be properly identified. The tomb in question grandly marks the lair belonging to tradesman James Livingston, brother-in-law to the figure at the heart of this tale - Mary Stevenson, widow of stonemason James Witherspoon, who died of 'Dropsy' (Edema) on 16th November 1822. Mary's life and experiece seems, from what few mentions are made of her in Burgh records, to be no more dramatic than that of most middle-aged matrons of her class and era - and many might wonder why she, a poor relation of the prosperous Livingston, should be honoured with burial in his family plot. the headstone is certainly dramatic - befitting, perhaps, the unfortunate events which followed her death. Its cental image is that of a skull-headed reaper, using scythe and spade to force a richly attired figure deep into the pit of an open grave. A grim Memento Mori, reminding us that rich or poor, Death is the one great democrat who makes equals of us all. On the frosty morning of 22nd November 1823, just a few days after Mary's funeral, a grim discovery was made amid the stony sprawl of the kirkyard. The earth around the Livingston lair was sunken and scattered - the pit a gaping maw. It seemed certain that the horror which had for so long terrorised the graveyards of Edinburgh and Glasgow had visited the Royal Burgh. The graverobbers - or 'Ressurrection Men' - had come to call - raising the newly dead to sell to surgeons and anatomists for study and dissection. The only legal sources for such specimens was the gallows and the Poorhouse, and supply simply could not satisfy demand. A prime specimen could command a price of £12 in the 1820s - £8-10 for that of a woman or child. This had long been an outrage in Edinburgh, where the nation's greatest medical schools demanded a constant supply of suitable specimens...but nothing of the kind had yet been reported in the Burgh of Stirling! As news spread, the faithful of the Burgh scrambled in the dirt to ensure that the remains of their own dear-departed had not been desecrated. How, these God-fearing folk bewailed, could a body rise up to meet its maker on Judgement Day if it had been subject to a butcher's blade? This was a crime against Providence! The identity of the graverobbers was soon discovered, as a number of locals noted a certain local wastrel was inexplicably flush with cash in the taverns of the Old Town. That he literally knew-where-the-bodies-were-buried - he was the Holy Rude's grave-digger and Sexton - James McNab was an obvious suspect. Unable to explain his sudden wealth, McNab was beaten and questioned by the Town Guard. To everyone's surprise he cockily confessed his crime, and named his partner in the deed, a former schoolmaster named Daniel Mitchell. Why so brazen? Under Scots Law a dead body had no value. Graverobbers were routinely charged with theft of clothes, jewellery or other property buried with a corpse. If the doctors had dissected and disposed of a stolen body, then no evidence remained of the crime - and a forced confession, such as that elicited through beating, could easily result in failed prosecution. Only four years later, in Edinburgh, the notorious Irish 'Bodysnatchers', William Burke and William Hare - responsible for at least sixteen murders to provide specimens for the Anatomist Robert Knox and others - very nearly escaped punishment altogether, as no physical evidence of their villainy remained. Burke, in the end, was charged with the theft of a woolen shawl belonging to one of his victims, and hanged - but only because Hare had been persuaded to turn King's Evidence against him! Mitchell and McNab soon named their employer, a medical student named John Forrest - born into one of Stirling's most lauded families - who promptly fled the country, joined the army, and took up service as a military surgeon in Canada. Much to everyone's surprise, the graverobbers were released: the result of a clerical error in re-drafting the charges against them, in Forrest's absence. Smugly they sauntered out of the cells, but their bravado was to be short-lived, as within an hour the townsfolk had massed against them, armed with sticks and cudgels. They stormed McNab's lodgings, forcing him out of an upper window in his hovel, and pursuing him accross the moon-lit rooftops. Others raided Mitchell's rooms. Soldiers from the Castle garrison were called to aid the Town Guard. A nervous Private fired over the head of the mob, in a desperate attempt to restore order - and a full-scale riot ensued. The townsfolks' sticks and cudgels were set against the bayonets and rifle-butts of the solders. Mercifully, though fighting continued well into the early hours of the following morning, no fatalities occurred. By dawn the terrified graverobbers were restored to their rightful place in the Tolbooth cells. A tower was raised near Cowane's Hospital in order to keep watch over the Auld Kirkyard. Heavy iron cages - Mort Safes - were hired to place over new graves, until such time as the bodies beneath were too far rotted to be of intertest to the anatomists. The rusted remains of a number of these can still be found in parts of the churchyard. Armed guards patrolled the areas for many weeks, desperate to deter further Ressurrectionism. The problem of Mitchell and McNab persisted. Their fate is unknown. In the absence of a body no physical evidence of their crime was available, and John Forrest remained in the colonies, unavailable for comment or questioning. That their names do not appear in records of executions or public punishment possibly indicates that they were released - which may explain why locals, dissatisfied with that outcome, soon fashioned the tale of the pair being pursued by the vengeful wraith Mary Stevenson (or Witherspoon, depending on the account). Fictional vengeance was better than none. And Dr Forrest? His wealthy family successfully petitioned the Crown and the High Court to free him from the stigma of involvement with the graverobbers. Charges against him having been dropped, he returned to Stirling, and was promptly elevated to the post of Inspector-General of Hospitals for Scotland - a reminder of the sad fact that doctors were never punished for the mayhem and upset which they encouraged by soliciting stolen bodies. They were, as one commentator at the time noted, 'men of good family and noble intent'. 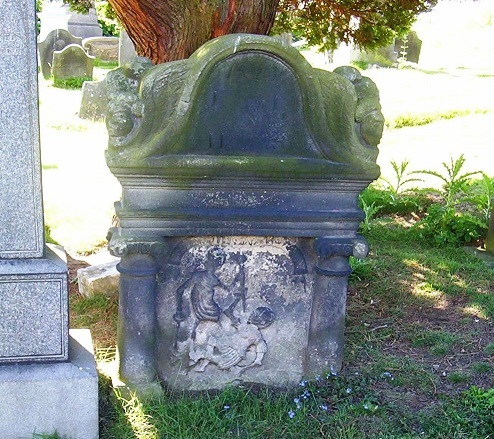 The location of Mary's remains were never recovered, and her name does not appear on the refurbished 18th-century headstone raised by her brother-in-law (though his initials, 'JL', are prominent. All that remains as a reminder of her sorry after-life is the date - '1823' - to mark her passing. 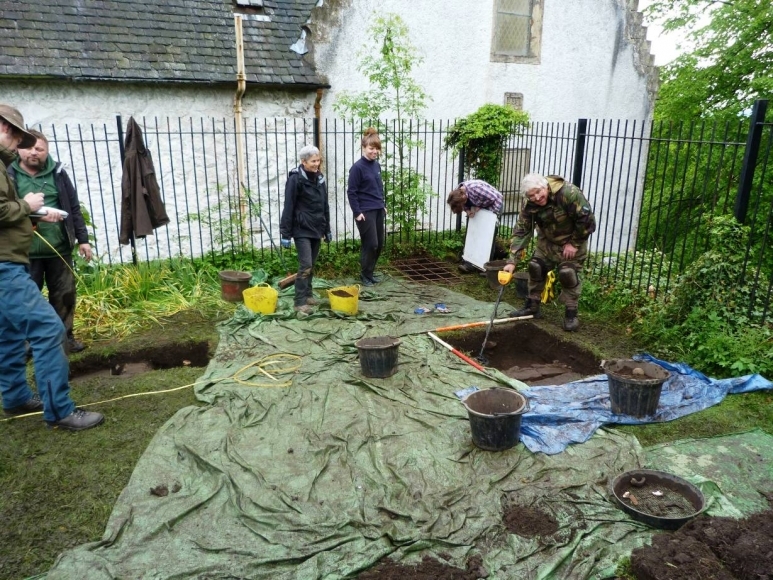 On Saturday 22nd April 2017 a dig organised by Stirling Archaeology located the foundations of the Watch House, in the Auld Kirkyard, near Cowane's Hospital...just where The Hangman thought it was. Spooky!